Blisters from shoes, nobody wants them. It’s bad enough wearing shoes that rub a little, but when it gets to the point that you’re in so much you can’t stand to walk anymore, you know you need a solution. I’ve struggled to find footwear that doesn’t irritate my skin. If it’s not my heel that suffers, it’s between the toes. Heels for events, runners for the gym, flats for work… and to top that off, I get contact dermatitis from Band-Aids and the inserts you can buy never stay in place. My feet are literally a pain! That’s where blister balm has come in handy. 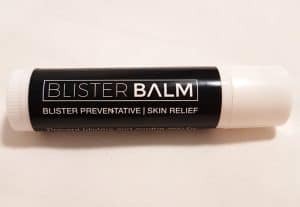 It’s a balm with all natural ingredients designed as a preventative measure to chafing footwear. You simply apply to high friction areas of the foot and massage into the skin. I find this especially great for between the toes to stop skin rubbing and causing discomfort. The balm comes in a super handy wind up tube so you can keep it with you on the go. Perfect for long days and travelling. This is not to be applied to already formed blisters as the ingredients aren’t designed to heal, but to prevent. There is also a chance of staining of leather and fabric, but this is the case with and cream, liquid or balm. As always, patch test before use. We all react differently to products.